Explore the African Savannah with The King Slot at Moon Games! It is a creation of iSoftbet coming with 5 reels and 25 paylines. On this game, meet the King who is not Elvis Presley but instead the mighty Lion! Discover the lovely landscape of the African plains and catch a glimpse of the wild animals. The reels are set within an ornate golden frame with 2 lion heads on either side. They consist of the following symbols: Lion, Elephant, Yak, Zebra, A, K, Q and J. Launch this slot on a desktop or mobile device at Moon Games! On The King Slot, start by selecting your preferred coin value on the Coin Value field. Once done, click on the Spin button to initiate the reels. Alternatively, you can use the Auto Play feature to enjoy several automatic rounds played in rapid succession. This can also be stopped anytime during the game. Amount of Paylines Selection: The 25 paylines remain active throughout the game and cannot be modified. Coin Values: The coin values range from £0.01 to £1.00. Look out for the Lion on The King Slot! It is Wild and replaces all symbols, except Scatter and Cash Wheel Bonus. Scatter is represented by the Paw Print symbol which helps to generate King Spins. When 3 or more Paw Print symbols land on reels 1, 3 and 5, eight free King Spins are triggered. On any free spin, 2 to 5 reels sync to show matching symbols. 6-10 Cash Wheel Bonus symbols let you spin the Super Cash Wheel. 11-14 Cash Wheel Bonus symbols trigger the Mega Cash Wheel. 15 Cash Wheel Bonus symbols activate the Epic Cash Wheel. The reward depends on where the pointer lands. Make the most of this rewarding game feature! 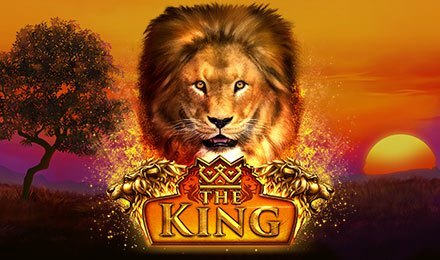 Launch The King Slot anytime at Moon Games and explore the African plains. Good luck!